With the start of each new year, millions of people resolve to take their health and fitness seriously, whether it means losing ten pounds or fifty. Gym memberships soar in the month of January, but all too often the influx of new members has peaked and died off well before Valentine’s Day, whether their goal has been reached or not. However, failure to stick with a rigid diet and exercise plan - some of which can be unrealistic or downright unattainable - does not mean that consumers are stuck with unwanted extra pounds, or other aspects of their appearance they wish to change. Kybella is an FDA approved cosmetic injectable that helps to melt stubborn chin fat. MI-Skin Dermatology and Laser Center was among one of the first dermatological practices in the country to offer Kybella to patients. CoolSculpting is a non-surgical body contouring procedure that freezes fat cells without surgery or scars. 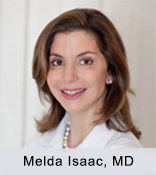 Dr. Melda Isaac is a board-certified dermatologist located in Washington, DC. Her practice, MI-Skin Dermatology Center, is a comprehensive skin care practice which offers the latest and most advanced state-of-the-art technology to improve the skin’s appearance. Dr. Isaac obtained her medical degree from Penn State University, and completed her dermatology residency at George Washington University. She is an active member of the American Academy of Dermatology, the American Society for Dermatologic Surgery, the Women’s Dermatologic Society, the American Society for Laser Medicine and Surgery, and the Washington, DC Dermatologic Society. You can find out more about Dr. Isaac and MI-Skin Dermatology Center at http://www.mi-skin.com.